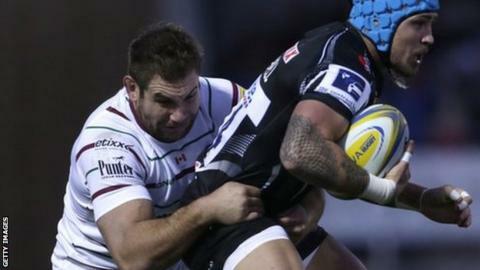 London Irish and Canada back row Jebb Sinclair hopes World Rugby will act in time to give Tier Two nations better support at the next World Cup in 2019. Sinclair, 29, made three appearances for Canada in the 2015 tournament, but was unable to help them to a win. Critics felt short turnarounds between games for nations like Japan hampered them progressing from the pool stage. "Four years ago in New Zealand, it was exactly the same argument, but nothing has changed," Sinclair told BBC Sport. Sinclair, who scored a try for London Irish in their opening Premiership fixture against Leicester, hopes progress can be made in time for the 2019 tournament in Japan. "Everyone went on a campaign after the 2011 World Cup and were tweeting and writing articles about it," he added. "But once again, it all faded away. Hopefully this time, they will work on it for four years' time." Capped 42 times by Canada, Sinclair believes more games against Tier One nations before the next World Cup will enhance their chances of competing. "We played Scotland two summers ago and Ireland before that, but that was during a British Lions tour when they weren't at full strength," he said. "If we get two or three of those games a year, you would notice drastic improvements."